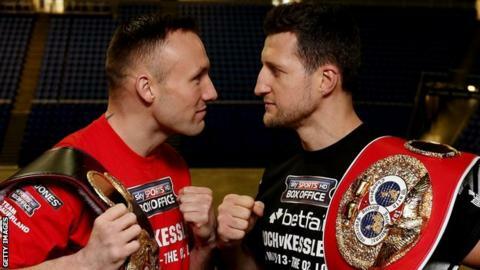 Britain's Carl Froch has predicted that his world title fight with Mikkel Kessler will be an "epic contest". The 35-year-old IBF world super-middleweight champion faces WBA belt holder Kessler in a unification bout at London's O2 Arena on 25 May. Froch lost his first professional bout when he was beaten on points by Kessler in his native Denmark in 2010. "Mikkel is an honourable man and I thank him for coming over for what will be an epic contest," said Froch. He has since won, lost and won that world title again - memorably winning the IBF belt with a fifth-round stoppage of Lucian Bute last May. But Froch admits he is still troubled by his defeat to Kessler and is determined to put it right. "When my head hits the pillow on a night I still think about the defeat to Mikkel," he said. "I think about it because he took away my world title and my career was in tatters. I have since avenged it by coming back, but that was a bitter pill to swallow and I need to make amends." Kessler's only other appearance in Britain saw him lose to Joe Calzaghe in front of 50,000 fans at the Millennium Stadium in Cardiff - the defining night of the Welshman's career. The 33-year-old is annoyed that he never got a rematch against the Welshman but has stood by his pledge to give Froch a second chance. "I am ready for this. I never got a rematch against Calzaghe and I told Carl that I would do the honourable thing and give him one," said Kessler. "I told him it would happen and now I'm here and I am ready."